"In London alone, today, there are more than half a dozen puppeteers"
For many years now, it has been the custom to include the making of a Kasperle (or Punch & Judy) theatre in the craftwork course of Prussian school teachers. For Germany, in common with other Continental countries, is a great believer in puppet art. Herr Paul Brann, of Munich, who has been giving performances in England for some months and who is one of the foremost of Germany's puppeteers, has made the relation between puppets and music an extraordinarily intimate one. One of Mozart's operas, for instance, is performed with the full musical score. Human singers, of course, provide the voices, but they are hidden away behind the stage. So well do the rhythmic movements of the "dolls" synchronise with the singing, that to the spectator, it seems as though the puppets themselves are producing the sounds. 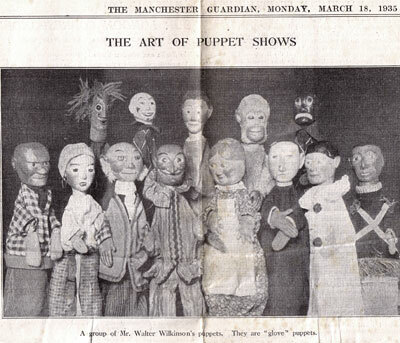 Walter Wilkinson is one of the best known of British puppet workers. He has walked over great stretches of England showing his ingenious "peep show" at schools and inns, on commons and village greens, in market places and by the wayside, in mansions and farmhouse kitchens, in theatres and in barns. His puppets, like the figures of Punch & Judy, are of the "glove" type. His characters, however, are much more varied and take part in scenes typical of Old English Country Life. They can juggle and sing; they can wrestle and dance. Perhaps among them all, John Barleycorn is the most beloved. Once when Mr Wilkinson was crossing the Polish frontier, old John succeeded in making even the staid Customs Officials laugh, so comic and telling were his gestures. We have been so much accustomed to looking on Punch & Judy as our English exponents of puppet drama, that we are often apt to forget how many other puppet types there are. True, it is not only in this country that Punch plays his part in his little canvas theatre, he is also well known on the Continent under such names as Pulcinella in Italy, Polichinelle in France and Kasperle in Germany and Austria. But besides glove puppets and stringed marionettes, there are also stick and shadow puppets, each type with its own characteristic qualities. Shadow puppets have played their part in Javanese puppet theatres for many hundreds of years. In china and Japan, they have long been incorporated into the everyday life of the people. Shadow "dolls" are often coloured so that not merely dark shadows fall on the screen, but daintily tinted and shaded figures also. Herr Brann is not the only Continental puppeteer who has recently visited England. Earlier, we had Vittorio Podreca with his entire "Teatro Dei Piccoli" brought from Italy. This theatre included as many as 800 piccoli (or little people) and nearly 1000 costumes. Then there was Richard Teschner, the Viennese puppet worker, who gave a series of performances at the time the Austrian Exhibition was being held in London. His puppets include not only "human" figures, but beasts and insects also. They are carved from jade, ivory and ebony. His insects have jewelled eyes and antennae of platinum or gold. All these celebrated workers have characteristic qualities of expression. But here in England, too, our workers are just as individual and as highly specialised in their craft. In London alone today, there are more than half a dozen puppeteers, and last season, for the first time, puppeteers were included in the Malvern Festival. Puppets are indeed rising once more in the hierarchy of the dramatic world. Malvern is so reminiscent of Bernard Shaw that it is timely to recall what "GBS" once said about puppets. He thinks that they "can move you as only the most experienced living actors can," and he holds up "wooden actors as instructive object-lessons to our flesh and blood players." This perhaps is a rather more modest and moderate expression of opinion than that of Anatole France, who had "an infinite desire to see marionettes replace living actors." We may doubt whether they could ever do anything of the sort. Still, there is no doubt that "puppets can move you" with their amazing powers of impersonation. Their artistic possibilities are considerable and it is no wonder that they are returning to favour in England and that our colleges are opening their doors wide to them.